One of the coolest parts of my job is getting to work with some of my favorite brands, and I’m so excited to continue to work with Sabra* again this year as part of their 2015 Tastemakers panel. I love snacking on hummus all throughout the day, but I thought it would be fun to incorporate it into a breakfast recipe so I can get my hummus fix early and start my day off right. This Hummus and Feta Omelet recipe also comes at a perfect time – Thursday, May 21st is National Hummus Day! 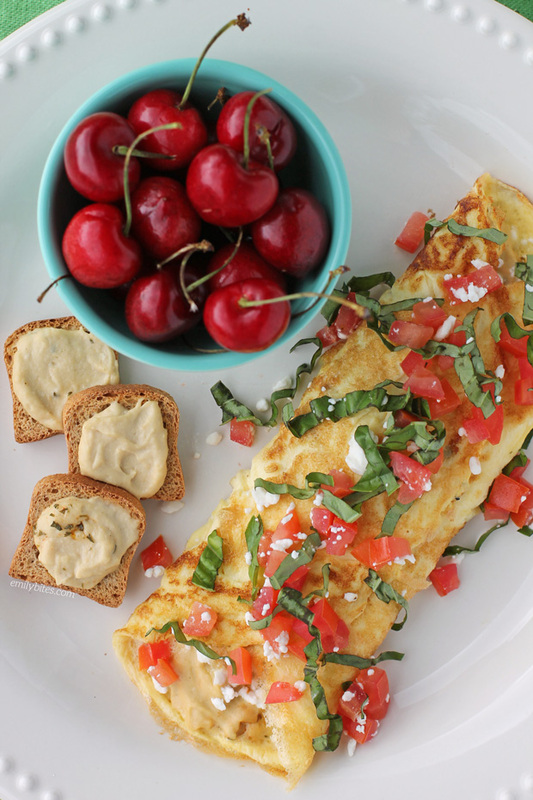 This Hummus and Feta Omelet is super filling, low in carbs and packed with 17 grams of protein. Plus, it’s delicious. You can use any hummus flavor you like, but I highly recommend the Roasted Pine Nut – it’s rich, nutty and heavenly. Hummus tastes great with eggs and pairs really well with salty Feta cheese and the fresh flavors of basil and tomatoes. This is a breakfast that will get you moving, satisfy your taste buds and keep you full until lunch. This omelet would also make a great breakfast-for-dinner option. To celebrate National Hummus Day, Sabra will be giving away special offers and coupons on their Hummus Day website all day on Thursday, May 21st – make sure to head over and score a deal on hummus so you can buy some to make this omelet! For more breakfast recipes, like my Sausage and Stuffing Bake, Blueberry Baked Oatmeal Singles, Silver Dollar Banana Pancakes, Ham and Cheese Hash Brown Quiche or Carrot Cake Doughnuts, check out the Breakfast Recipe category in my recipe index. In a mixing bowl, combine the egg, egg whites, water, salt and pepper and whisk together until thoroughly blended and beaten. Bring a medium skillet over medium-high heat and add the butter. Make sure the butter coats the bottom of the pan as it melts. Once the butter is melted, add the egg mixture to the pan. Use a spatula to push the eggs from all around the edges into the center so that the set eggs are pushed into the middle and the egg liquid seeps back to the edges of the pan. When the edges are set and the center is getting there, drop small amounts of hummus in a line down the center of the omelet, then spread them a bit with the back of a spoon. Sprinkle most of the feta (I reserved a bit for the topping) over the hummus so that there is a straight line of filling down the middle. Use a spatula to fold one side of the omelet over the center filling, then tilt the pan (folded side first) toward your plate and use the spatula to slide the omelet onto your plate and fold the other side of the omelet over the filling. 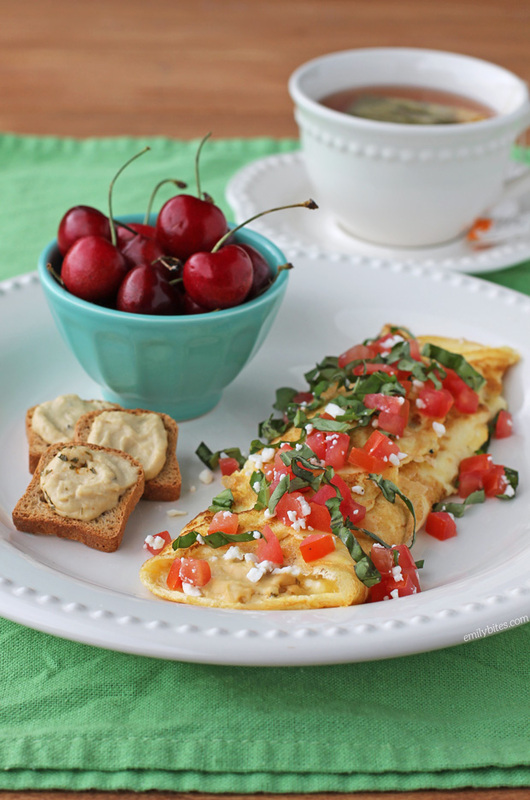 Sprinkle the sliced basil and diced tomatoes over the top of the omelet along with any remaining feta and serve.